Disney World is the land of imagination, making it the perfect place to celebrate the holidays! 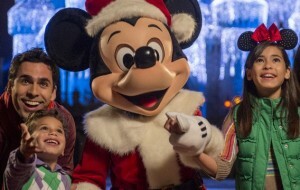 At Mickey’s Very Merry Christmas Party, being held at the Magic Kingdom select nights from November 7-December 19, you’ll be able to enjoy live entertainment, spectacular fireworks and an oh-so-jolly holiday parade in the happiest place on earth. This Christmas, the Disney docket will be packed with live entertainment the whole family will enjoy. You’ll see Anna, Elsa, Kristoff and Olaf (plus Mickey and Santa of course) during Mickey’s Once Upon a Christmastime Parade, which will take over Main Street, U.S.A. Cinderella’s Castle will also light up in a breathtaking music and fireworks show, A Frozen Holiday Wish, as Tinkerbell soars above your head and Jiminy Cricket reminds everyone that home is where to heart is, especially during the holidays. If that’s not enough, Buzz Lightyear, Mike Wazowski and Stich will fight holiday doldrums across the galaxy in the jolly musical, Totally Tomorrowland Christmas. There will also be character meet and greet opportunities throughout the park, magical snowfall along Main Street and free cookies and hot cocoa for all. The festivities run from 7:00 p.m. to midnight on November 7, 10, 13, 14, 16, 20, 21 and 30 as well as December 2, 4, 5, 7, 9, 11, 12, 14, 16, 18 and 19. Tickets start at $67 per person, but remember, separate Magic Kingdom admission is required. Have you every been to Mickey’s Very Merry Christmas Party? How was it? What was your favorite part of the festivities?